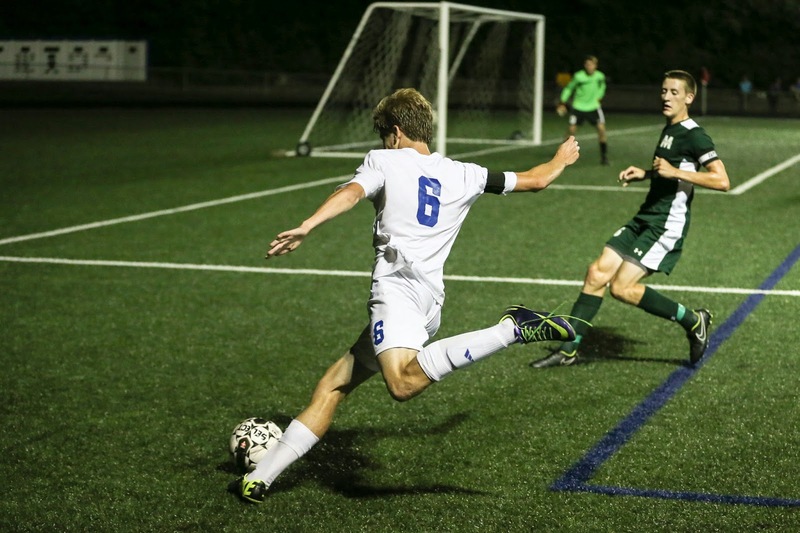 The early-season struggles continued for the Highlands Bluebirds soccer team. The defending 9th Region champion Bluebirds (0-4-1) dropped their fourth in a row falling 2-0 to the Simon Kenton Pioneers at Tower Park. They have scored just one goal in the losing streak. Allen Ramsey. Highlands senior wide receiver Justin Weyer (4) tries to make a catch against Campbell County's Eli Matthews (13) in Friday's non-district game in Alexandria. Highlands won 23-16. The game started off on the usual great note for the visitors Friday. The tradition-rich Highlands Bluebirds scored 23 points in the first quarter and appeared headed for another blowout win. But that didn’t happen. The defenses took over and the Campbell County Camels made a late run before Highlands escaped with a 23-16 win. Allen Ramsey. Highlands senior running back Griffin Urlage (20) finds a hole in the 23-16 Bluebird win. Highlands won its 13th straight over Campbell County on Friday. Allen Ramsey Photo. Highlands senior wide receiver Alex Veneman (6) hauls in a touchdown pass in the first quarter of Friday's non-district game in Alexandria. 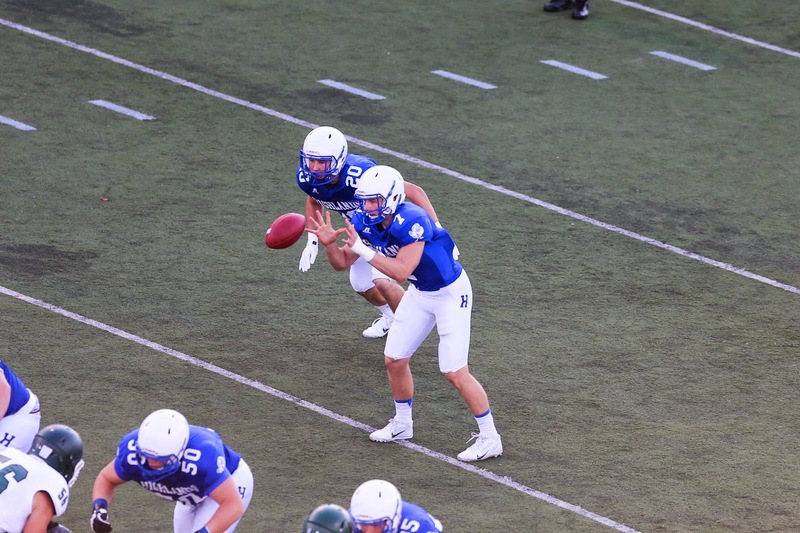 Veneman had five catches for 66 yards and a touchdown in the 23-16 Bluebird win. Last year, Campbell County Head Coach Stephen Lickert said the Camels would continue to play the Bluebirds and he hopes to beat them at some point. The new season did not get off to the start the Newport Central Catholic Thoroughbred football team hoped for. The host Cooper Jaguars (2-0) shut out the Thoroughbreds, 31-0 in their season-opener in Union. 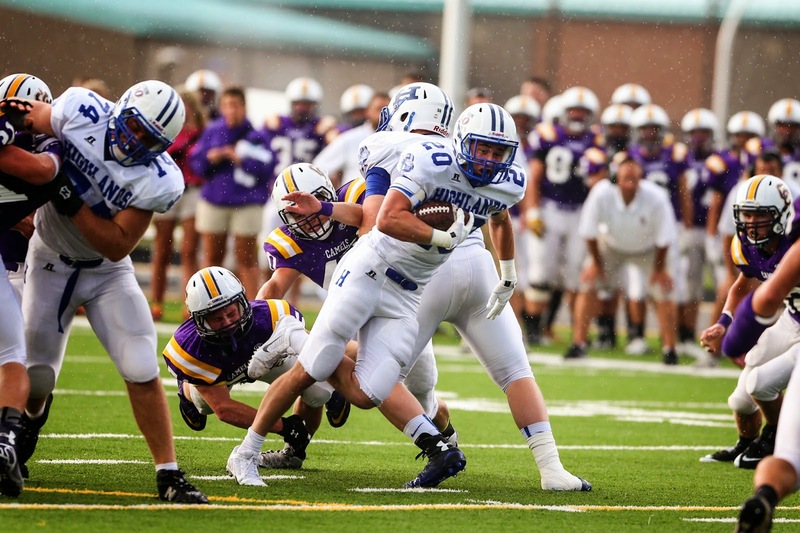 NewCath’s originally scheduled game was on Aug. 23 at Ashland. But it was rained out. Allen Ramsey Photo. 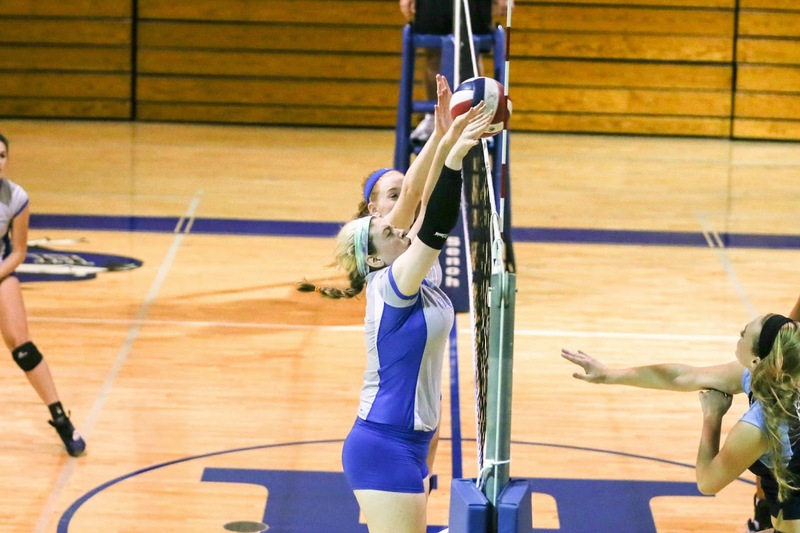 Highlands' Kaitlin Hall (front) and Anna Marie Houliston (back) record a block against Boone County in Tuesday's 9th Region match. The Ladybirds won 3-2 to move to 2-3 on the season. Allen Ramsey Photo. Highlands senior Logan Groneck (6) makes a move in Thursday's game against Cincinnati McNicholas. Groneck scored the lone goal for the Bluebirds in a 3-1 loss at Tower Park. 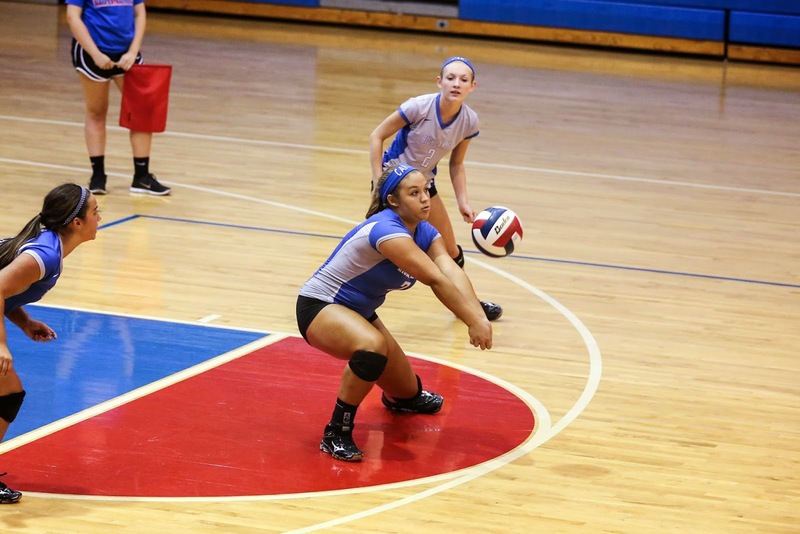 The Highlands Ladybirds volleyball team (2-3) made it two in a row Thursday with a 3-2 (25-14, 25-20, 21-25, 21-25, 15-11) win over visiting Boone County. Allen Ramsey photo. Highlands sophomore running back Jared Pulsfort (91) makes a move in the scrimmage at Cincinnati St. Xavier on Friday. Highlands travels to Campbell County on Friday. The teams may have faced off 60 times overall. But none of those meetings have taken place at the new Campbell County High School Athletic Complex. That will change Friday when the county rivals line up for what is expected to become an annual meeting like it was between 1995 and 2004. The new stadium is entering its second season Campbell County played at Bob Miller Stadium behind the Campbell County Middle School for 69 years. But Mother Nature gave them no choice. Thus, the Newport Central Catholic Thoroughbreds open the season at Cooper on Friday. Game time is 7:30 p.m.
NewCath found itself in this position after Friday’s scheduled game at Ashland was rained out. Heavy storms in eastern Kentucky left Putnam Stadium in bad shape and the schools could not work things out to play the game. The Newport Central Catholic soccer teams won their All “A” 9th Region semifinal contests Wednesday. They scored two goals each and let the defense do the rest. Allen Ramsey Photo. 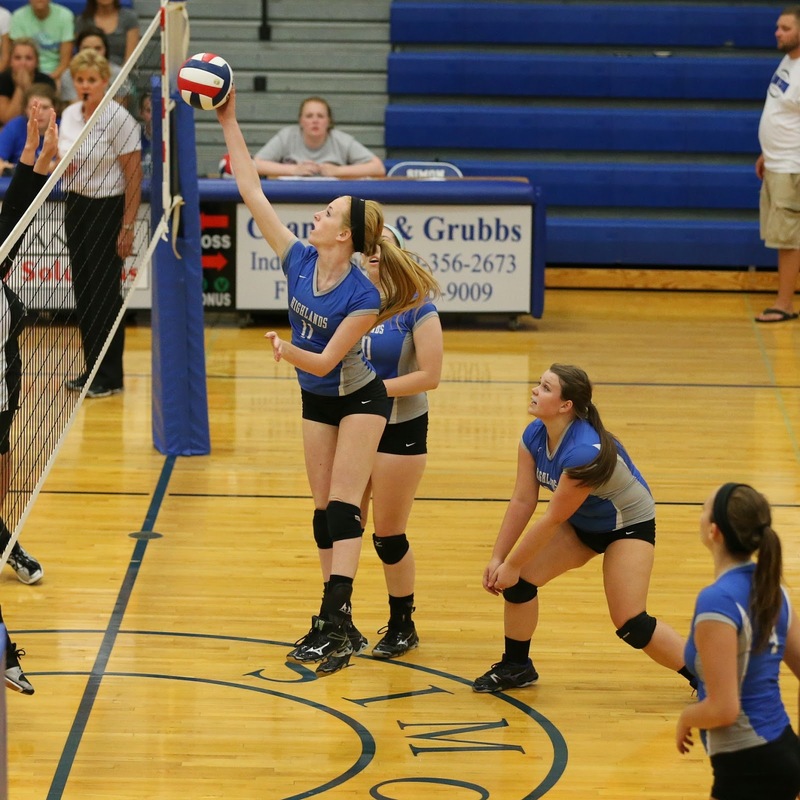 Highlands junior Anna Marie Houliston (11) records a block in Tuesday's match at Simon Kenton. The Ladybirds won their first contest of the year. It may have taken four games. 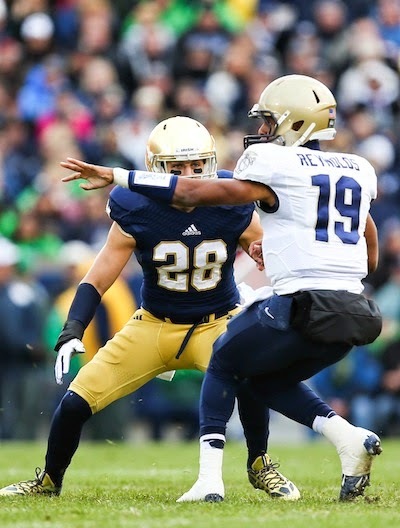 Notre Dame safety Austin Collinsworth keys in on an opponent last year. The Fighting Irish named him one of four captains Tuesday. Austin Collinsworth hopes to make his fifth and final year for the Notre Dame Fighting Irish his best one. Allen Ramsey Photo. Highlands junior Izzy Schultz (center) passes the ball in Monday's game at Conner. Conner won the match in three games. The Highlands Ladybirds soccer team once again showed it can play with the best Monday. The Highlands Ladybirds soccer team played the host and defending state champions tough Saturday. Allen Ramsey Photo. Highlands senior defensive lineman D.J. 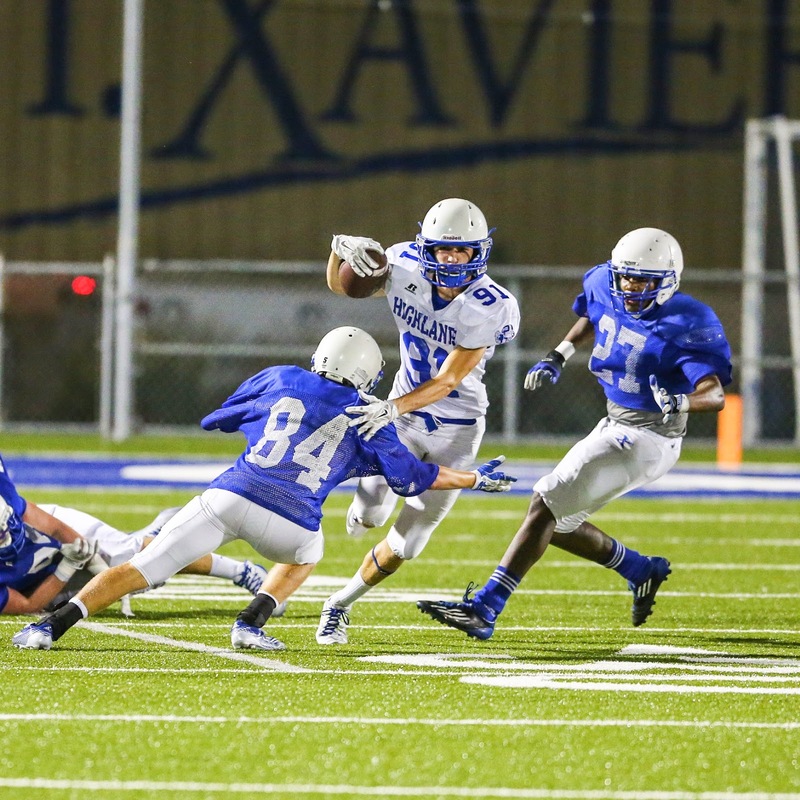 Mills (42) pursues Cincinnati St. Xavier running back Sean Prophit (32) in Friday's scrimmage. Allen Ramsey Photo. 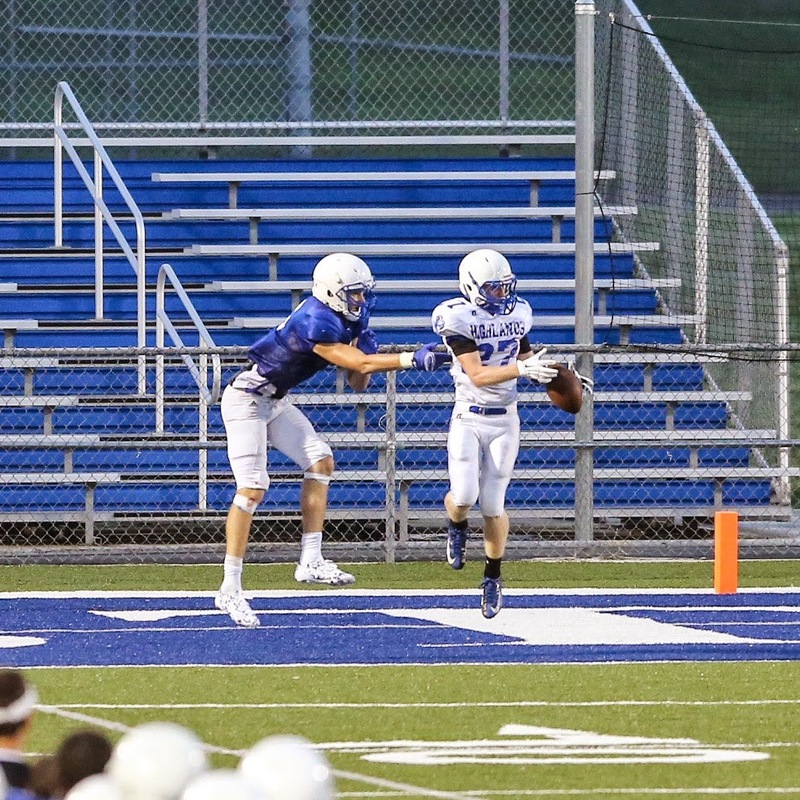 Highlands junior defensive back Austin Beal (right) steps in front of Cincinnati St. Xavier junior wide receiver Andrew Homer (left) and returns the interception 100 yards for a touchdown in Friday's scrimmage. CINCINNATI – The Highlands Bluebirds football team showed major improvement in the “glorified practice” Friday at Cincinnati St. Xavier’s Ballaban Field. The varsity played for 2.5 quarters and won 15-10. The junior varsity played the last 1.5 of the four quarters and was outscored 20-0 making the final score 30-15 in favor of St. Xavier. The Highlands Bluebirds soccer game against St. Henry was cancelled Thursday. Allen Ramsey Photo. Highlands senior quarterback Beau Hoge (7) takes a snap while Griffin Urlage (20) makes a move in Friday's scrimmage against Louisville Trinity. The Bluebirds travel to Cincinnati St. Xavier for their second scrimmage on Friday. In previous years, the Highlands Bluebirds football team played just one scrimmage against Louisville Trinity. But when University Christian (Florida) could not work things out to return to Fort Thomas, things opened up for another scrimmage. 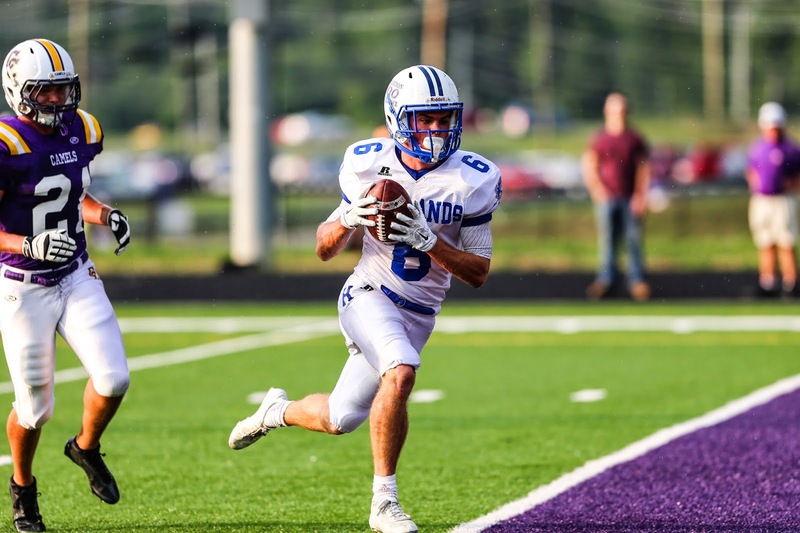 Highlands will take on another tough opponent in that scrimmage when it travels to Tom Ballaban Field on Friday to take on the Ohio Division I power Cincinnati St. Xavier Bombers of the Greater Catholic League South. Game time is 7 p.m. in Cincinnati. G. Michael Graham Photo. The Ashland Tomcats (white uniforms) and Newport Central Catholic Thoroughbreds (blue uniforms) face off in the season-opener on Friday again this year. NewCath won last year's meeting 37-26. It is a name that rings bells not only in eastern Kentucky, but for any opponent of the Ashland Blazer Tomcat football team. Ashland standout running back Quentin Baker has been on the minds of the Newport Central Catholic Thoroughbreds for a few weeks as they prepare for their usually tough non-district grind against bigger schools. Eventual Class 2A runner-up NewCath beat Ashland, 37-26 at Newport Stadium to open last year. Baker rushed for 238 yards on 18 carries and two touchdowns in that contest. The Thoroughbreds travel southeast to face Baker and company on Friday. Game time is 7:30 p.m. at the newly-renovated Putnam Stadium in Ashland. The trip may take a couple hours. But the Thoroughbreds are not concerned about it. The Newport Central Catholic Lady Breds soccer team had a game scheduled at Cooper to open the season Wednesday. It was cancelled because of lightning storms. Mary Schmalzl Photo. Highlands junior Ben Seiter (19) battles Scott's Stephen Kiehborth (8) in Tuesday's game. The teams tied 2-2 to open the season. They fought back to tie the game twice. Down the stretch, the Highlands Bluebirds soccer team had its chances to take the lead, but could not finish. The end result was a 2-2 against the Scott Eagles in the season-opener for both teams at Tower Park on Tuesday. G. Michael Graham Photo. Highlands goalkeeper Olivia McQuery (left) gets ready to boot the ball away from the goal while Peyton Bankemper (7) gets in position. McQuery made six saves in the win. The Highlands Ladybirds soccer team showed how far it has come in terms of mental toughness Monday. Highlands found itself down by a goal at various points on the first half. But the Ladybirds came back to post a 3-2 win over the visiting St. Henry Lady Crusaders in the season opener for both teams at Tower Park. Allen Ramsey Photo. Highlands senior defensive back Grayson Heck (32) records an interception in Friday's scrimmage against Louisville Trinity. 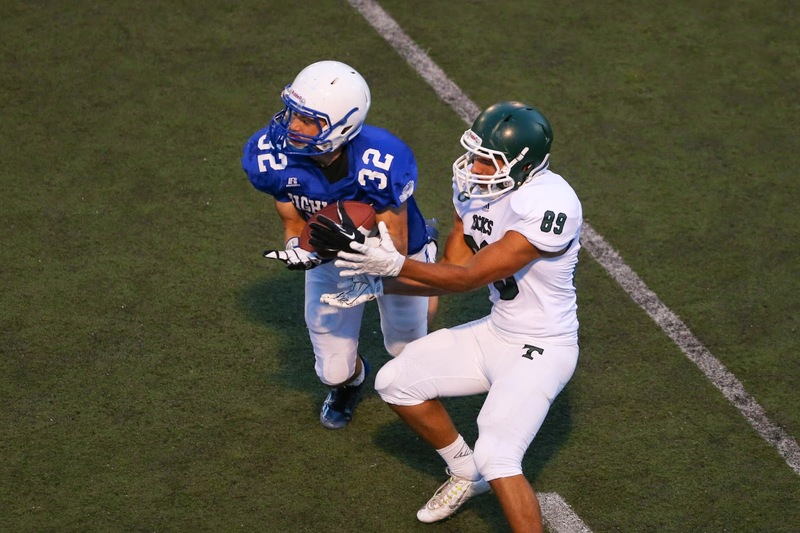 Trinity won the three-quarter scrimmages, 31-6. Allen Ramsey Photo. 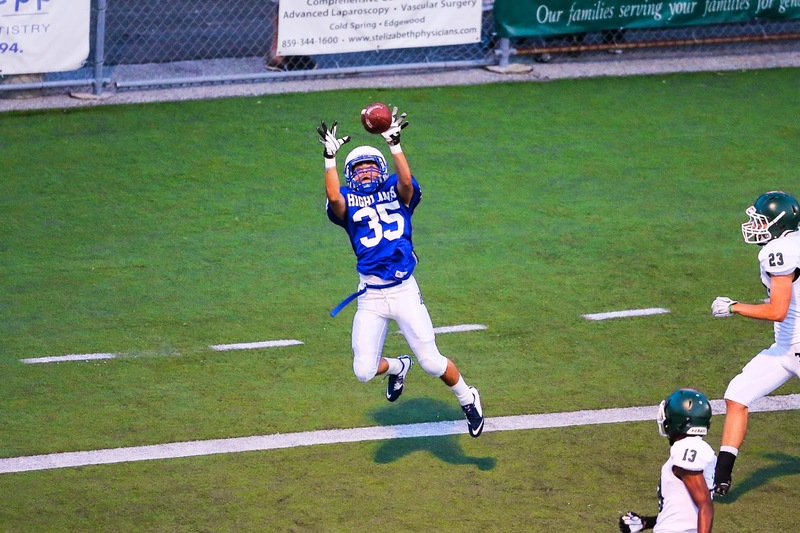 Highlands junior Taylor Perez (35) goes up for a catch in Friday's scrimmage against Louisville Trinity. The two teams tend to expose opposing weaknesses like crazy. That’s why the Highlands Bluebirds and Louisville Trinity Shamrocks own Kentucky-record 22 state championships each and are aiming to bring gold trophies back to their respective campuses this year. Trinity lost to Louisville Male in the Class 6A regional finals last year and Highlands fell to Collins in the 4A title game. Allen Ramsey Photo. 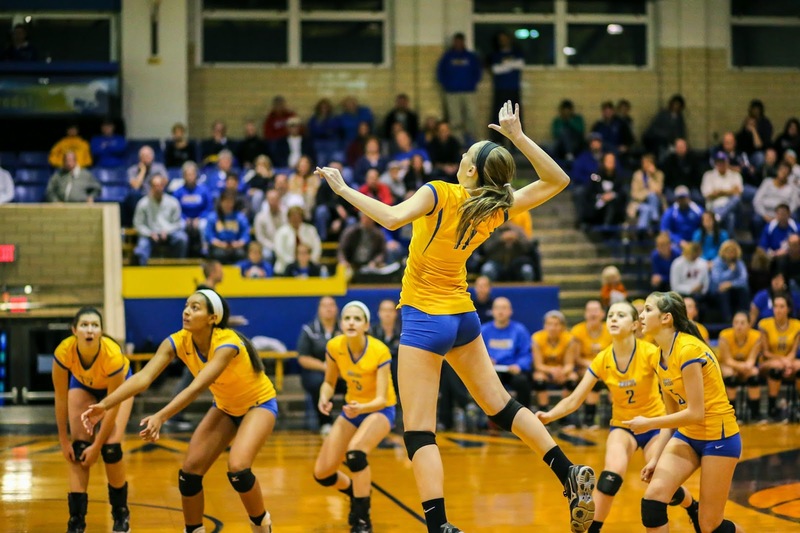 Newport Central Catholic sophomore Rachel McDonald (11) sets up for a spike in last year's 36th District championship game. NC lost to Ryle in the 9th Region semifinals last year. The Newport Central Catholic fall sports teams are going through transitions like many teams do. Allen Ramsey Photo. Highlands senior Beau Hoge (center) catches a touchdown pass in last year's Class 4A semifinal contest at Lexington Catholic. The Bluebirds and Knights could meet in the same round this season. When it comes to Classes 4A and 2A in Kentucky, the Highlands Bluebirds and Newport Central Catholic Throughbreds are often mentioned in the state championship breath. Contributed Photo. 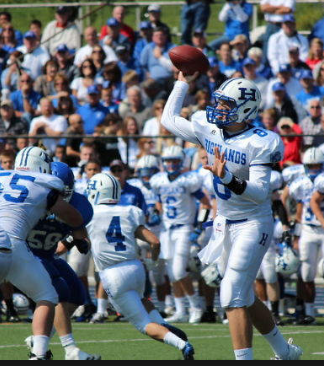 Former Highlands quarterback Patrick Towles (right) throws during the 2011 meeting at Covington Catholic. The Bluebirds won that game, 42-37 and have won 11 straight in the series. The two teams have a combined 28 state championships. 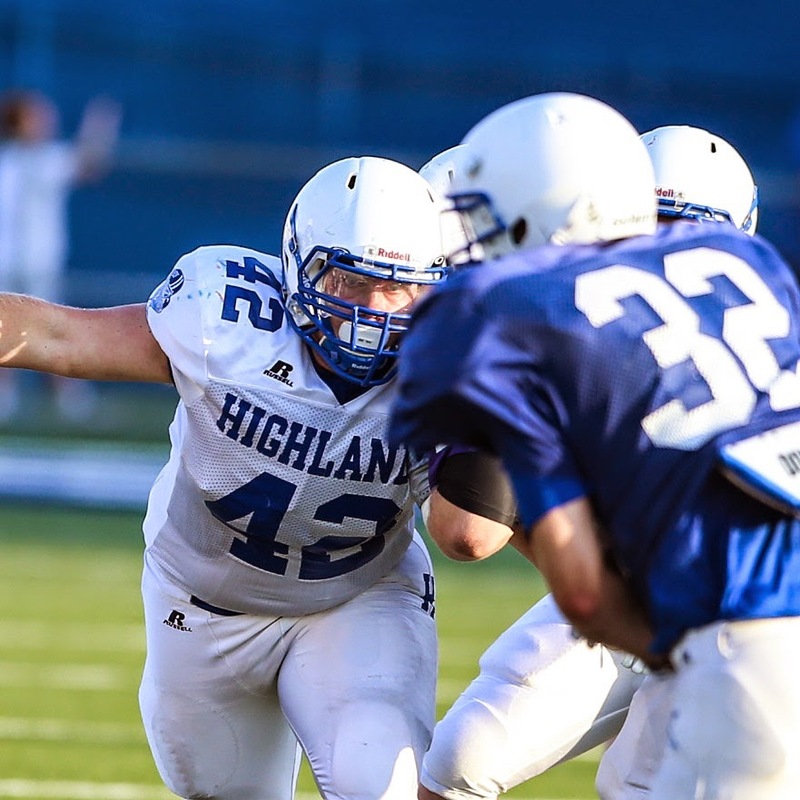 Editor’s Note: This is the final story leading into the 100th season of Highlands football. It’s a northern Kentucky football rivalry that has a huge vibe to it every time it is said. 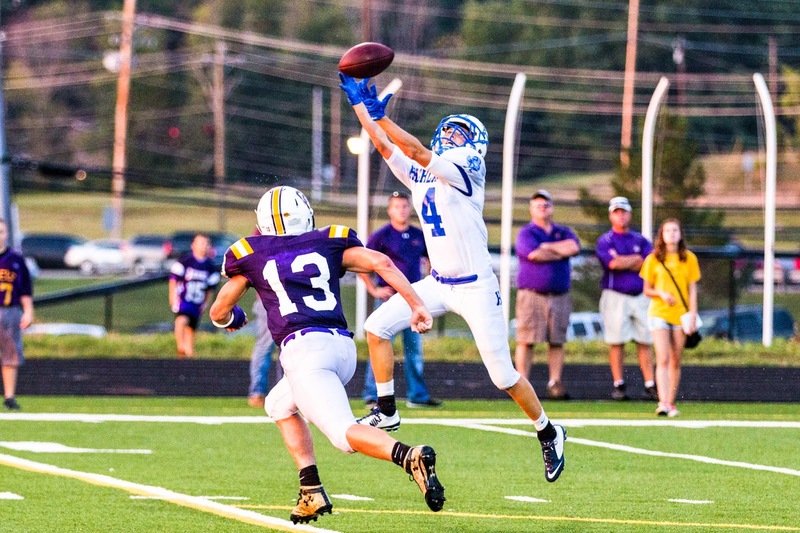 The Highlands Bluebirds and Covington Catholic Colonels have faced off in the regular season every year since 1968. The Colonels began their program in 1967. The Bluebirds lead the all-time series, 45-17. G. Michael Graham Photo. The Newport Central Catholic Thoroughbreds return linemen like seniors Colin Hoover (60) and Logan Neff (54) from last year's Class 2A state runner-up squad. The Royal Blue and Gold have been a model for consistency in Class 2A football for the past 14 years. Allen Ramsey Photo. Highlands wide receiver Evan Allen (83) hauls in a pass between two defenders in last year's Class 4A state championship game in Bowling Green. The Bluebirds set the new state mark with six straight state championships and have played in seven straight title games. Editor’s Note: This is the third of four stories of Highlands football leading into the 100th season in school history. The Boyle County Rebels set the mark for the most consecutive football championships in Kentucky with five straight from 1999 to 2003. Contributed Photo. 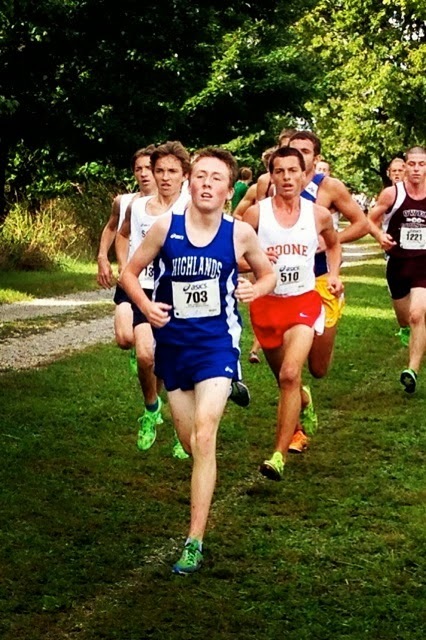 Highlands junior Ethan Shuley tries to pull away from the pack in a race last year. Shuley leads a strong group of juniors as both teams try to bring home the AA state championships in the same year for the first time since 1979. The Ladybirds are the two-time defending AA champions. It has not been done since 1979. The Highlands cross country teams would love to both bring home the state championships in the same year for the first time since then. The Ladybirds are the two-time AA champions and are heavily favored to three-peat. They’ve won eight in school history and are tied with Pulaski County in the state for the most state championships behind St. Henry’s 16 titles. G. Michael Graham Photo. Highlands Head Boys Soccer Coach Matthew Winkler (right) discussed strategy with assistant Dave Kraus after a recent practice. Winkler is entering his fifth season as the head coach of the Bluebirds. It’s the feeling of joy teams receive when they play great soccer at the right time of the year. 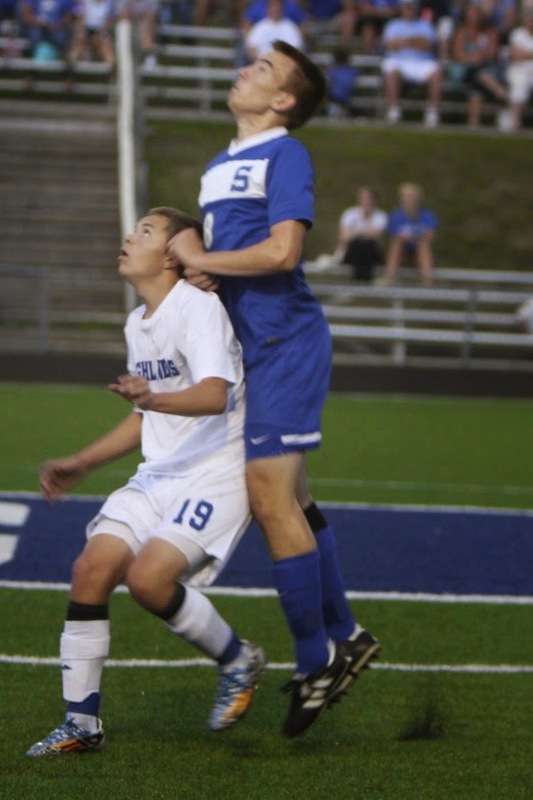 The Highlands Bluebirds soccer team put things together in the 9th Region Tournament and embarked on a memorable run. They shut out their three region opponents by a combined 9-0 on their way to their first region championship since 2010. The Bluebirds edged Newport Central Catholic, 1-0 when Mitch Gesenhues scored on a ball that bounced in the box following a Cole Davis-Roberts free kick about a minute into overtime. Allen Ramsey Photo. Highlands junior Jared Dougherty punts the ball in last year's Class 4A state championship game against Collins. Dougherty returns after punting, kicking off and handling extra-point and field-goal duties last year. The offense put up its high-octane numbers last year. 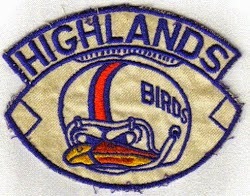 But the defense did not dominate at the high level the Highlands Bluebirds football team is used to despite its depth. Injuries played a huge part of that. Many guys played, but not at full strength. Allen Ramsey Photo. Highlands wide receiver Alex Veneman (left) hauls in a pass against Lexington Catholic in last year's Class 4A semifinal contest. Veneman leads a solid returning core of wide receivers for quarterback Beau Hoge to throw to. Some may be wondering if the Blue and White will go through a Viva La Vida. That is a 2008 song by the British band Coldplay about a king who falls from his throne to an average citizen. But the Highlands Bluebirds football team hopes tradition proves otherwise. G. Michael Graham Photo. First-year Highlands Ladybirds Head Girls soccer coach Brian Wiefering gives instructions during a recent practice. Highlands finished 8-8-5 last year losing in the 9th Region title game to Notre Dame, 3-0. If the end of last season showed a major indication, the Highlands Ladybirds soccer team is in store for great things. Allen Ramsey Photo. 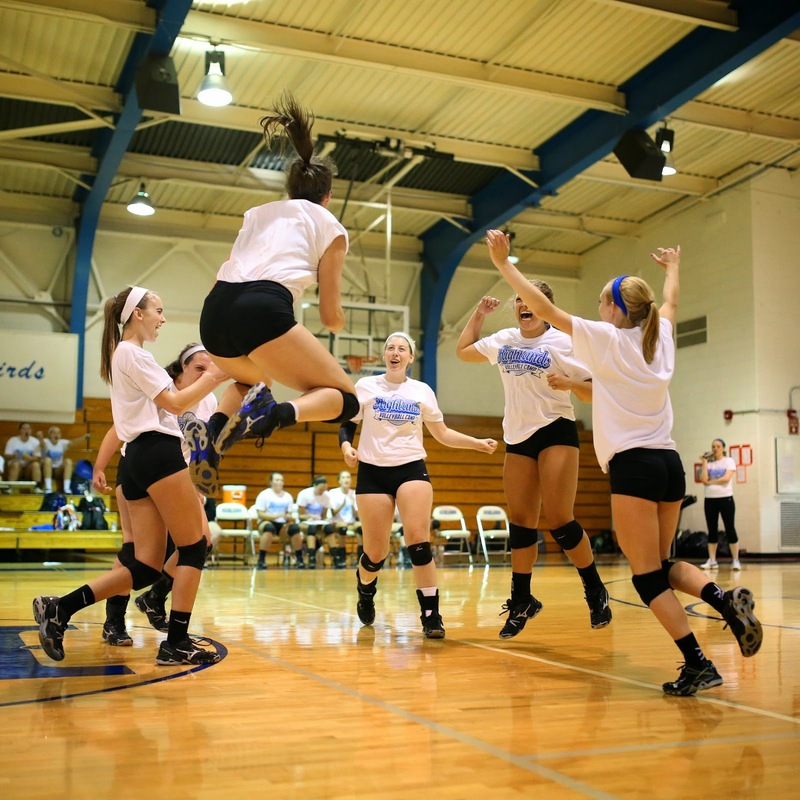 Highlands celebrates a point in Tuesday's scrimmage against Harpeth Hall (Tennessee). The Ladybirds are hoping to use their experience to build a solid foundation with new Head Coach Katelyn Sallee. The mountain may be long and tough. But new Highlands Ladybirds head volleyball coach Katelyn Sallee and staff have been gearing up for the challenge. Sallee, a former Simon Kenton and Morehead State University standout, took over the program after Whitney Mulroney resigned in the spring. Mulroney and husband Kevin, a former Highlands football player, are expecting their first child.